Michigan winter fun is an enjoyable way to create some of your fondest memories. Our way of enjoying Michigan winter fun is usually heading out on the weekends and driving along the lake stopping frequently for a cup of coffee and enjoying the pure winter beauty. 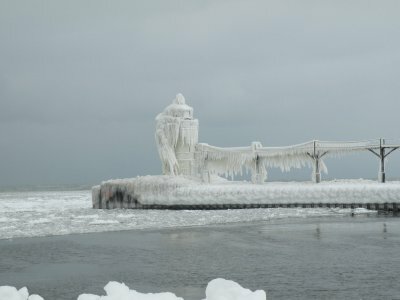 I love Michigan Lighthouse's especially in the winter. Mother nature has a way of icing them up so they look really "alien" like. Now if your going to venture out on the piers where many are located you must be safe! Here I am at the end of the south pier in St. Joseph Michigan in mid January. Isn't this wild! This is no time to show off or try anything risky. I don't go out unless the pier is safely accessible. If your not sure don't go. I won't take children or pets because things happen quickly with them. If you fall in or go thru the ice out here it's over! No horseplay ... this is a very beautiful but dangerous time at the lake. No matter the time of year you must respect Lake Michigan. Go with your gut instinct ... if it doesn't feel safe it isn't! If you love winter sports you'll find plenty of "romantic" Michigan ski lodges and resorts that offer down hill runs and plenty of cross country trails. You will learn to understand terms like "wind chill" and "lake effect" snow but hey ... it's winter. The sunsets are still beautiful and the drives along the lake (weather permitting) still give you amazing, majestic views. The key to enjoying winter anywhere is dressing for the weather. Sue and I always carry extra clothing in the car. We have a bag with extra hats, gloves, vests and scarves. Even when it's a sunny winter day as you get closer to Lake Michigan the wind coming off the lake is bone chilling. Safety Tip: As beautiful as the ice along the shore is please do not venture out on it. Many have lost their lives falling thru or sliding into openings in the ice. 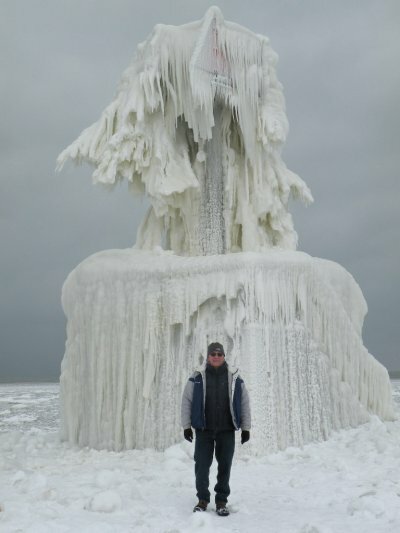 Stay off the ice on Lake Michigan shorelines! It's a slower time of year so most of the places to stay will have special rates or getaway packages. The ski lodges may be busier than the inns, bed and breakfasts or hotels. If you plan on staying at one of them be sure to book in advance. 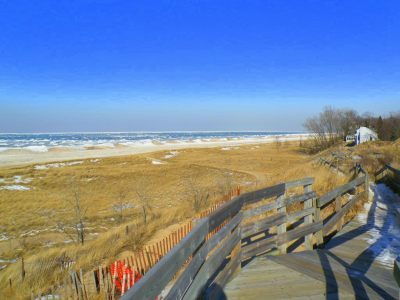 Tell Us What you do for fun along Lake Michigan during winter. 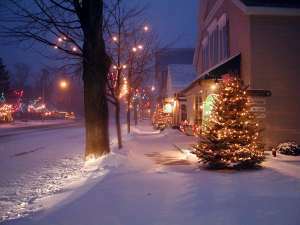 Winter in Michigan is about holiday shopping with snow gently falling. Small shops all decked out with Christmas decorations and the streets lined with lights. You can't help but get caught up in a feeling of old fashion charm of Christmas's past. What Is Your Favorite Michigan Wintertime Activity? What is your favorite Michigan winter fun thing to do together? Share it! Do you have a picture to add? Great! Click the button and find it on your computer. Then select it. Photos must not be any larger then 800x600 pixels. 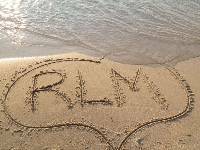 Fom Michigan Winter Fun Back To Romantic Lake Michigan home page.